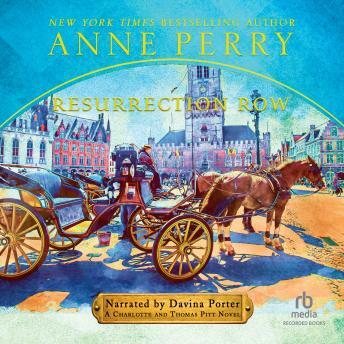 Fourth in the series of Charlotte and Thomas Pitt mysteries, Anne Perry's Resurrection Row explores the dark undercurrents that run through the lives of the idle rich in Victorian England. After a wonderful night at the theatre, Thomas and Charlotte find themselves confronted with a corpse in the driver's seat of a hansom cab. Even more shocking-it is the body of a peer of the realm who had been decently buried the week before. While the doctor insists Lord Fitzroy-Hammond died a natural death, the Pitts find the situation anything but natural. Determined to get to the bottom of things, Inspector Pitt begins his investigation within the proper channels while his intrepid wife Charlotte renews a tie from her past to get inside Lord Fitzroy-Hammond's world. But as they dig their way closer the truth, they find themselves in danger from forces who will do anything to keep it buried.